Easy pick up of bulky Compost Soil Gravel Slate and Sand. Garden products to help you successfully grow plants and flowers. 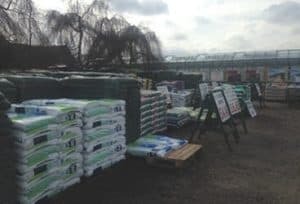 Selection of Compost including Multi Purpose compost, Levington potting compost, Ericaceous compost and Professional Seed compost. Lime free Grits and Sands from the Meadow View Stone range. These are superb for improving the drainage of difficult soils and compost, propagation, top dressing pots and troughs and Silver sand for lawn top dressing & aeration. The slates are re-cycled, bi-product of the roofing industry and is a a cost effective mulch, which alleviates water evaporation, whilst providing a pervious surface for plants and wildlife.